Quarantine: What does it mean? Are They a Problem in Your Area? Is it a Gypsy Moth? 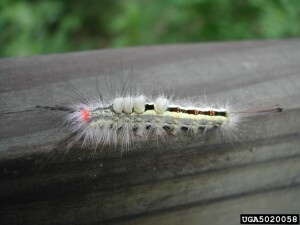 Home » Life Cycle and Biology » Is it a Gypsy Moth? 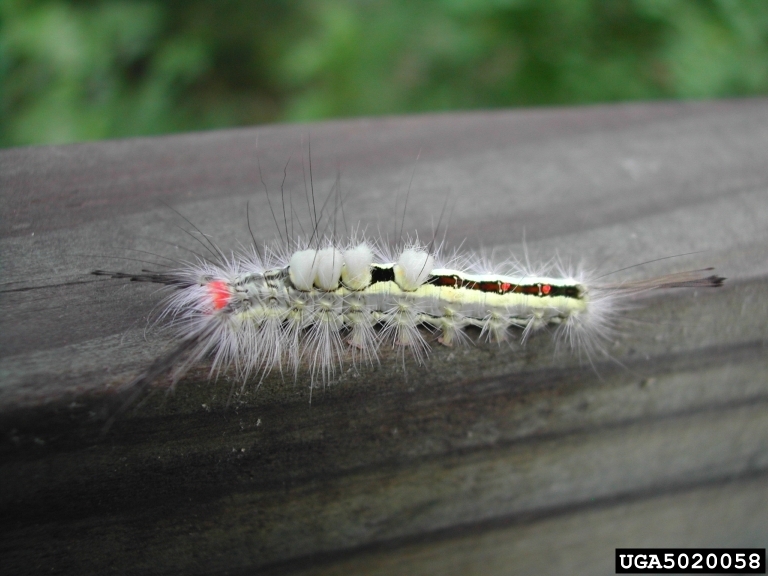 There are several hairy, bristly, or tufted caterpillars that are often mistaken for the gypsy moth. The following pictures and descriptions will help you distinguish among them. Clicking on an image will bring up a larger version. Distinctive markings: Five pairs of blue dots followed by six pairs of red dots down the length of back. Note: just after hatching when the caterpillars are very young they look black and the other markings are difficult to see for another week or two. Behavior: The gypsy moth feeds on oaks, crabapple, linden, willow, birch, aspen, and more than 300 other species of trees. 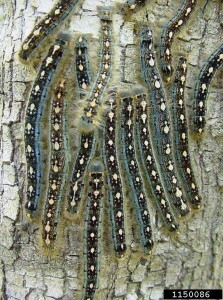 The caterpillars hatch in April or May and feed through early July. During an outbreak they can strip trees, seemingly overnight. They do NOT build silk tents. Photo Credit: Bill McNee, WI Department of Natural Resources. Distinctive markings: White or yellow stripe running down the center of the back, small blue spots along the side. 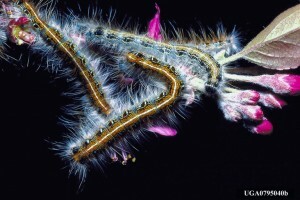 Behavior: This caterpillar constructs tents where branches fork in cherry, wild cherries, crabapple, and apple trees. These caterpillars feed in May and early June on the trees their tents are built in. The tents may linger into the summer before falling apart. 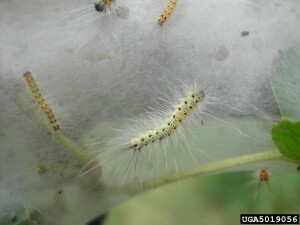 Eastern tent caterpillars rarely cause significant damage, though people have done permanent damage to their trees by excessive pruning to cut out the tents or by using fire to kill the caterpillars. Instead, tree owners should wait until dusk, wear rubber gloves, and strip the tent and the caterpillars out of the tree using their hands. 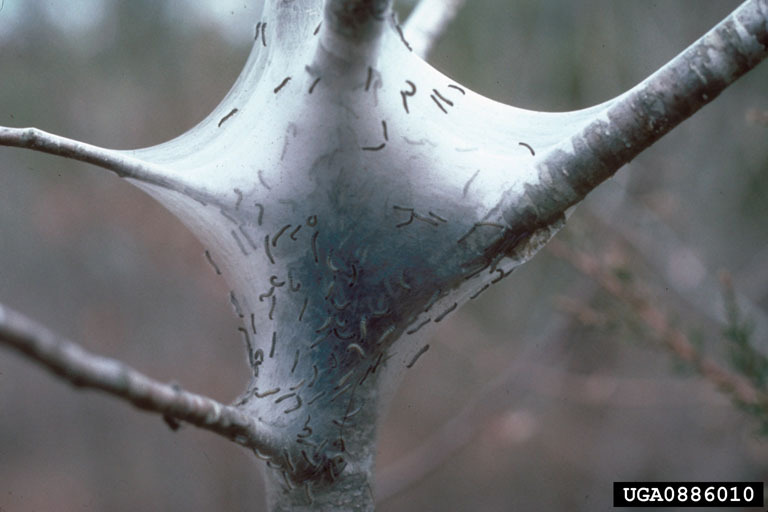 The tent and caterpillars can then be plunged into soapy water, buried, or burned farther away from the tree. Photo Credits: Gerald J. Lenhard, Louisiana State Univ. Image 0795040. Forestryimages.org; Tim Tigner, Virginia Dept. Forestry Image 0886010. Forestryimages.org. Distinctive markings: A velvety, sky blue skin with a black stripe marked with a row of white “footprints” or “keyhole” shapes down its back. Behavior: Despite its name, this caterpillar does NOT make a tent. Populations increase dramatically about every 10 years in the northern third of Wisconsin. During outbreaks, forest tent caterpillars will strip aspen, oaks, sugar maple, and a few other tree species of leaves in early June. This caterpillar does not feed on evergreens. Photo Credit: Herbert A. ‘Joe’ Pase III, Texas Forest Service. Image 1150086. Forestryimages.org. Distinctive markings: Long gray hairs arising from yellow, orange, or black bumps. Behavior: This insect builds its large nests in mid- to late summer. 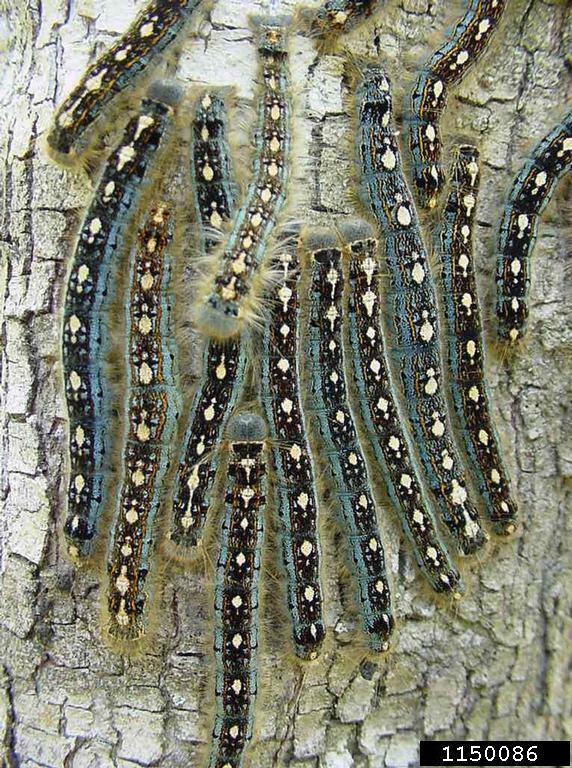 It only starts to feed after the gypsy moth has stopped and has emerged as an adult. 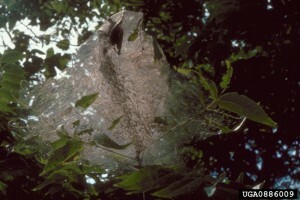 This caterpillar webs together branches-usually out towards the end. 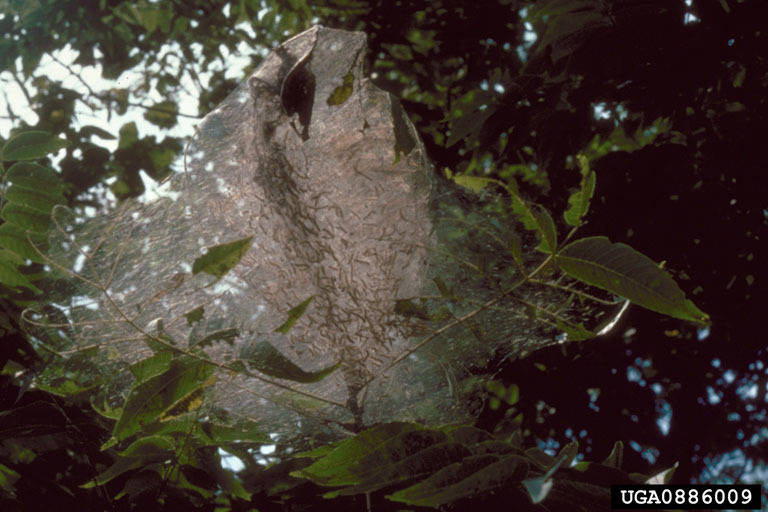 While these nests can be large, the damage is rarely significant for the tree. Photo Credits: Pennsylvania Dept. Conservation and Nat. Resources. Image 5019056. ForestryImages.org; Tim Tigner, Virginia Department of Forestry. Image 0886010. ForestryImages.org. Distinctive markings: A bristly “toothbrush” of white hairs on its back and two long tufts of hair projecting from its head and one from its tail. 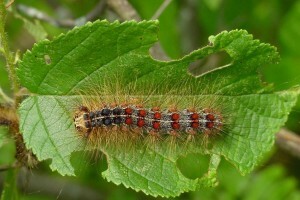 Behavior: This attractive caterpillar is often a problem in southeastern Wisconsin on crabapples, elm and other deciduous trees. It typically feeds in June-July. Photo Credit: Pennsylvania Dept. Conservation and Nat. Resources. Image 5020058. ForestryImages.org. Site content © 2001-2019 Wisconsin Department of Natural Resources. All rights reserved. Site design © 2001-2019 Board of Regents of the University of Wisconsin System, doing business as the Division of Cooperative Extension of the University of Wisconsin-Extension. All rights reserved.